Overview of popular 3D graphics libraries - OpenGL and DirectX. WebGL and three.js. Java3D. OpenGL fixed pipeline and programmable pipeline. Demos and explanation of basic OpenGL and 2D/3D graphics features. Demo of a WebGL/three.js program. Basic components of a computer graphics scene. three.js offical site. Creating three.js scenes using a graphical approach. Create a Chrome shortcut for development by using a target of "...chrome.exe" --disable-web-security --user-data-dir. Note OpenGL, WebGL, and three.js, as well as browser/device support, are evolving, sometimes fast. Components of a three.js graphics - scene, camera, and renderer objects. The coordinate system. Geometries, materials, and meshes. Scaling, translation, and rotation. Exercise. Interaction between lights and materials example - Spot light and Lambert material. Enable shadows. Cast shadows (light sources and objects) and receive shadows (objects). Exercise. The principle of animations. "requestAnimiatonFrame" function. Animating objects by translation and rotation. Rendering time. Frames and frame rate. Stats helper library. Adding animation statistics on screen. Exercise. Experimenting using the "dat.gui" library. Exercise - add controls to the camera. Resizing graphics with the browser window by handling the "resize" event. Readings - Chapters 1 & 2. THREE.Object3D, THREE.Scene, and concept of scene graph. Debug the scene and an individual object using the browser console. Use console.log. Scene functions - "getObjectByName", "add", "remove", and "traverse". "children" property. Add and remove objects from a scene. Count the number of objects. "instanceof" operator. "fog" property. Add linear or exponential fog to the scene. "overrideMaterial" property. Geometries. Vertices and faces (quadrilaterals and triangles). Built-in and custom geometries. Clone a geometry. Exercise - compose a triangle in 3D. Mesh attributes and functions - position, rotation, scale, translate(X|Y|Z), and visible. Cameras and objects in the 3-dimensional space with OpenGL. 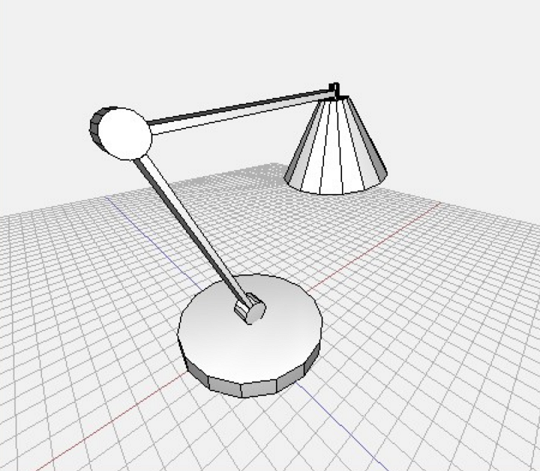 Perspective and orthographic views and corresponding three.js cameras. Camera parameters. Application of lookAt points. Exercises - Planet revolution. Lookat point. Light sources in three.js and their behaviors. Create and configure light sources. Basic lights - Ambient, point, spot, directional lights. THREE.Color class. Special lights - Hemisphere and area lights. Lens flare effect. Readings - Chapters 2 & 3. Exercises - Stage spot light simulation. Materials provided by three.js. Common material properties - basic, blending, and advanced. Simple meshes - basic, depth, normal, and face (deprecated) materials. Combining materials. Readings - Chapters 3 & 4. "Advanced" materials and meshes - Lambert for dull materials and Phong for shiny materials. ShaderMaterial with vertex shader and fragment shader. GLSL examples. Deprecated/deleted three.js objects and functions. Exam 1 on Wednesday. Covering weeks 1-6. Line geometry materials - LineBasicMaterial and LineDashedMaterial. Exercises - Lines and dashed lines. Optional - Deform a box using a vertex shader. Basic 2D geometries provided by three.js - Plane, Circle, Ring, and Shape. Bezier and spline curves. Basic 3D geometries provided by three.js - Box, Sphere, Cylinder, Torus, TorusKnot, and Polyhedron. Regular polyhedron geometries provided by three.js - Tetrahedron, Octahedron, Dodecahedron, and Icosahedron. Readings - Chapters 4 & 5. Introduction to "advanced" 3D geometries provided by three.js. Convex (Hull), Lathe, Extrude, and Tube (with SplineCurve3) geometries. Extruding from Scalable Vector Graphics (SVG) definitions. Creating 3D text using TextGeometry. Rendering 2D fonts as textures using HTML5 canvas (chapter 10). Wrapping meshes in ThreeBSP objects and applying binary operations - intersect, subtract, and union (can also use more efficient Geometry.merge - chapter 8). Sprites (particles) and point cloud (geometry only showing vertices). Trade-off between performance and controls over individual particles. Using HTML5 canvas functions to create textures ← Web programming contents. Sprites - Using an HTML5 texture from an HTML5 canvas to style THREE.SpriteMaterial. Point cloud - Using an external image file or the HMTL5 canvas output to style THREE.PointCloudMaterial. Using sprite maps. Loading texture files (more in chapter 10). Creating point cloud from basic and "advanced" geometries. Team project - Design and implement an animated 3D scene for the web. Difference between "group" meshes using THREE.Group and "merge" geometries using THREE.Geometry.merge. Saving and loading a mesh/scene in three.js JSON using HTML local storage API. JSON String ↔ JS Object ↔ Mesh/Scene. Creating meshes using programs (chapters 5, 6, & 8) ↑ or using modeling software exports (chapter 8) ↓. Adding and enabling three.js exporter in Blender. Loading a model in Blender and exporting it in three.js JSON. A few other formats are also supported by both. Loading geometries from external 3D file formats → Import loader & load file to meshes in a tree structure. Demo for three.js supported file formats - OBJ, MTL, Collada, STL, CTM, VTK, PDB, PLY, AWD, Assimp, VRML, and Babylon. Note exporting mesh/scene from three.js is a feature under development. Exam 2 due by 11pm on Wednesday. Working on the final team project on Monday. Animation review → 1. Change parameters & render. 2. Schedule the next rendering. Selecting objects. Using THREE.Vector3 to unproject and THREE.Raycaster to cast a ray from the camera to objects. Manually animating the camera. Camera controls - Trackball, Fly, Roll, FirstPerson, and Orbit. Other camera controls. Morphing with morph targets. MorphAnimMesh object for automatic animation. Manual animation using the morphTargetInfluences property. Skeletal animation. Bones and skinning. SkinnedMesh object. SkeletonHelper object. Using external models that support animation. Demos – Blender JSON model, Collada model, and MD2 model. Loading textures and applying to mesh materials. Filters and mipmaps. Standard image formats – PNG, GIF, and JPEG. Custom loaders for DDS, PVR, and TGA formats. Using bump map (1D info) and normal map (2D info) to generate wrinkles and bumps. Light map → static fine shadows. Environment map → reflections & refractions. Specular map → color highlights. Custom UV mapping in Blender and three.js programs. Repeat wrapping. Using HTML5 canvas rendering as the texture. Video textures using the HTML5 video element and the THREE.VideoTexture object. Postprocessing with fragment shaders. EffectComposer – Create, config, and render. Built-in effect passes – Bloom, DotScreen, Film, and Glitch. Using RenderPass to render. Using TexturePass to store a composer state and reuse it with other composers. Using MaskPass to apply passes to a specific area or an inversed area. Using ShaderPass to generate custom effects. Built-in shaders – Basic, blur-related, and "advanced". Creating custom shaders. Examples – Grayscale shader and bit shader. More information. More Examples. Introduction to the physics engine "physijs" and spatial sound. Wrapping geometries and materials in "physijs" to add gravity, collisions, friction, elasticity/restitution, etc. Available constraints - Point, Hinge, Slider, ConeTwist, and DOF (Degree Of Freedom). Readings - Chapters 11, 12. Final 3D web graphics team project demos. Final project file(s) due by 11pm on 4/23.